Alice Dowdell Service Details - Scranton, Pennsylvania | Miller Bean Funeral Home, Inc.
"With Love from Bill, Kate, Marty, Devin and Molly Murray"
Alice M. Dowdell of Scranton died Monday October 15, 2018 at the Allied Skilled Nursing Center. She was the widow of Francis J. Dowdell who passed away on April 25, 2001. Born in Scranton she was the daughter of the late Kleofas and Antoinette Ropel Kurowski. A graduate of Scranton Central High School, prior to retirement she was employed in retail in the Oppenheim Building. Alice enjoyed bowling and dancing, but the happiest time in her life was spent with her family and babysitting her grandchildren. She was a longtime member of St. Mary of the Assumption Church until its closing and was a current member of St. Paul of the Cross Parish. Alice’s family would like to extend a heartfelt thank you to the nurses and staff at Allied Skilled Nursing Center, 3rd Floor North, and to Allied Hospice for all of their kind and compassionate care. Surviving are daughters Patricia Musso and Mary Ellen Klassner and husband Paul, all of Scranton; son Bill Dowdell and wife Janice, Avoca; grandchildren Christopher Musso and wife Stephanie, Jennifer Jarecki and husband Jason, Dr. Stephanie Klassner Holstead and husband Don, Matthew Klassner, Caroline and Matthew Dowdell; 4 great-grandchildren; sister Jean Harrison, Scranton; several nieces and nephews. She was preceded in death by son-in-law Ronald Musso; sisters Marge Daly, Anna Domin, Josephine Skull, Mary Briskey, Stephanie Kunda, Helen McGraw; brother Henry Krosky and Clemence Kurowski. The funeral will be conducted Friday from the Miller Bean Funeral Home Inc., 436 Cedar Ave. Scranton with Mass of Christian Burial at Noon in Sacred Hearts of Jesus and Mary Church, St. Paul of the Cross Parish, 1217 Prospect Ave., Scranton. Interment St. Catherine’s Cemetery. Friends and family may pay their respects Thursday from 4-7 pm. In lieu of flowers memorial contributions may be made to St. Paul of the Cross Parish, 1217 Prospect Ave., Scranton, PA 18505. 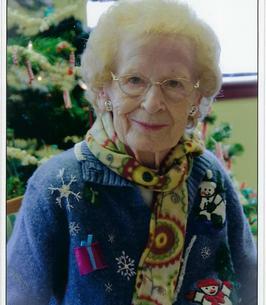 To send flowers to the family of Alice M. Dowdell, please visit our Heartfelt Sympathies Store.